Definition at line 1119 of file llfloatercustomize.cpp. Definition at line 1169 of file llfloatercustomize.cpp. References LLUICtrlFactory::buildPanel(), LLPanel::childSetCommitCallback(), LLPanel::childSetEnabled(), LLPanel::childSetLabelArg(), LLPanel::childSetValue(), FALSE, LLUICtrlFactory::getButtonByName(), gUICtrlFactory, mAllowModify, mHintMax, mHintMin, onHintMaxHeldDown(), onHintMaxMouseDown(), onHintMaxMouseUp(), onHintMinHeldDown(), onHintMinMouseDown(), onHintMinMouseUp(), onSliderMoved(), param, PARAM_STEP_TIME_THRESHOLD, S32, LLVisualParamHint::setAllowsUpdates(), LLPanel::setBorderVisible(), LLButton::setHeldDownCallback(), LLButton::setHeldDownDelay(), LLButton::setMouseDownCallback(), LLButton::setMouseUpCallback(), setVisible(), SLIDERCTRL_HEIGHT, and weightToPercent(). Definition at line 1221 of file llfloatercustomize.cpp. Definition at line 1256 of file llfloatercustomize.cpp. References LLPanel::childSetVisible(), LLVisualParamHint::draw(), LLPanel::draw(), LLView::drawChild(), f, FALSE, LLPanel::getChildByName(), LLVisualParamHint::getRect(), LLView::getVisible(), LLVisualParamHint::getVisible(), gFloaterCustomize, glPopMatrix, glTranslatef, LLFloater::isMinimized(), left, mHintMax, mHintMin, r, and TRUE. Definition at line 1402 of file llfloatercustomize.cpp. References f, gAgent, LLAgent::getAvatarObject(), LLTimer::getElapsedTimeF32(), LLSliderCtrl::getMaxValue(), LLSliderCtrl::getMinValue(), LLUICtrlFactory::getSliderByName(), LLVisualParamHint::getVisualParam(), LLVisualParamHint::getVisualParamWeight(), LLCharacter::getVisualParamWeight(), mLastHeldTime, mMouseDownTimer, LLSliderCtrl::setValue(), LLCharacter::setVisualParamWeight(), TRUE, LLVOAvatar::updateVisualParams(), and weightToPercent(). Definition at line 1396 of file llfloatercustomize.cpp. Definition at line 1358 of file llfloatercustomize.cpp. Definition at line 1479 of file llfloatercustomize.cpp. References gAgent, LLAgent::getAvatarObject(), LLSliderCtrl::getMaxValue(), LLSliderCtrl::getMinValue(), LLUICtrlFactory::getSliderByName(), LLVisualParamHint::getVisualParam(), LLCharacter::getVisualParamWeight(), PARAM_STEP_TIME_THRESHOLD, range, LLVisualParamHint::requestHintUpdates(), LLAgent::sendAgentSetAppearance(), LLSliderCtrl::setValue(), LLCharacter::setVisualParamWeight(), and TRUE. Definition at line 1389 of file llfloatercustomize.cpp. Definition at line 1351 of file llfloatercustomize.cpp. Definition at line 1441 of file llfloatercustomize.cpp. Definition at line 1365 of file llfloatercustomize.cpp. References LLPanelEditWearable::addVisualParamToUndoBuffer(), gAgent, LLAgent::getAvatarObject(), LLVisualParam::getID(), LLVisualParamHint::getVisualParam(), LLVisualParamHint::getVisualParamWeight(), LLCharacter::getVisualParamWeight(), gFloaterCustomize, mLastHeldTime, mMouseDownTimer, and LLTimer::reset(). Definition at line 1321 of file llfloatercustomize.cpp. References LLPanelEditWearable::addVisualParamToUndoBuffer(), gAgent, LLAgent::getAvatarObject(), LLFloaterCustomize::getCurrentWearablePanel(), LLCharacter::getVisualParamWeight(), gFloaterCustomize, and param. Definition at line 1340 of file llfloatercustomize.cpp. References gAgent, LLVisualParamHint::requestHintUpdates(), and LLAgent::sendAgentSetAppearance(). Definition at line 1305 of file llfloatercustomize.cpp. References LLSD::asReal(), gAgent, LLAgent::getAvatarObject(), LLSliderCtrl::getValue(), LLCharacter::getVisualParamWeight(), param, LLCharacter::setVisualParamWeight(), TRUE, and LLVOAvatar::updateVisualParams(). Definition at line 1524 of file llfloatercustomize.cpp. Definition at line 1240 of file llfloatercustomize.cpp. References LLView::getVisible(), mHintMax, mHintMin, LLVisualParamHint::setAllowsUpdates(), LLVisualParamHint::setUpdateDelayFrames(), LLView::setVisible(), and sUpdateDelayFrames. Definition at line 1227 of file llfloatercustomize.cpp. References LLPanel::childSetEnabled(), LLPanel::childSetValue(), LLVisualParamHint::getVisualParam(), mAllowModify, mHintMax, mHintMin, param, LLVisualParamHint::requestUpdate(), sUpdateDelayFrames, and weightToPercent(). Definition at line 1518 of file llfloatercustomize.cpp. References f, mParam, and param. Referenced by LLScrollingPanelParam(), onHintHeldDown(), and updatePanel(). Definition at line 1156 of file llfloatercustomize.cpp. Referenced by LLScrollingPanelParam(), and updatePanel(). Definition at line 1149 of file llfloatercustomize.cpp. 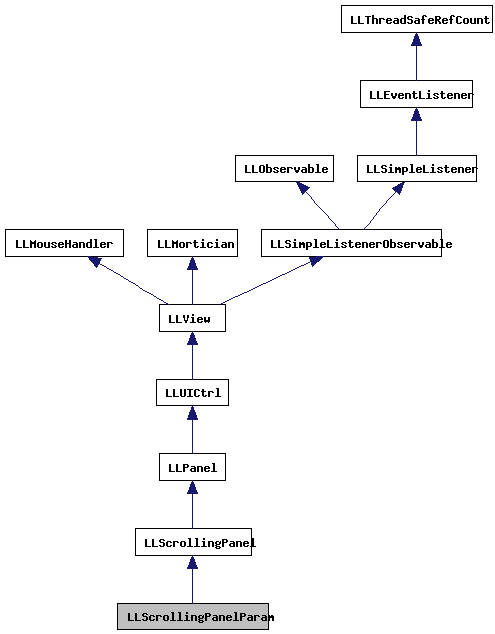 Referenced by draw(), LLScrollingPanelParam(), setVisible(), updatePanel(), and ~LLScrollingPanelParam(). Definition at line 1148 of file llfloatercustomize.cpp. Definition at line 1154 of file llfloatercustomize.cpp. Referenced by onHintHeldDown(), and onHintMouseDown(). Definition at line 1153 of file llfloatercustomize.cpp. Definition at line 1147 of file llfloatercustomize.cpp. Referenced by percentToWeight(), and weightToPercent(). Definition at line 1150 of file llfloatercustomize.cpp. Referenced by setVisible(), and updatePanel().